Parking for Med Inn is in Parking Structure P2. Remember the level on which you parked. If you will be visiting for more than 4 hours, bring your parking coupon with you to your appointment to be validated at the welcome stations for a reduced rate. Take the P2/P3 Parking Structure Elevators to Floor 2. Follow the overhead signs toward Med Inn Elevator 11. Take Elevator 11 down to Floor 1. 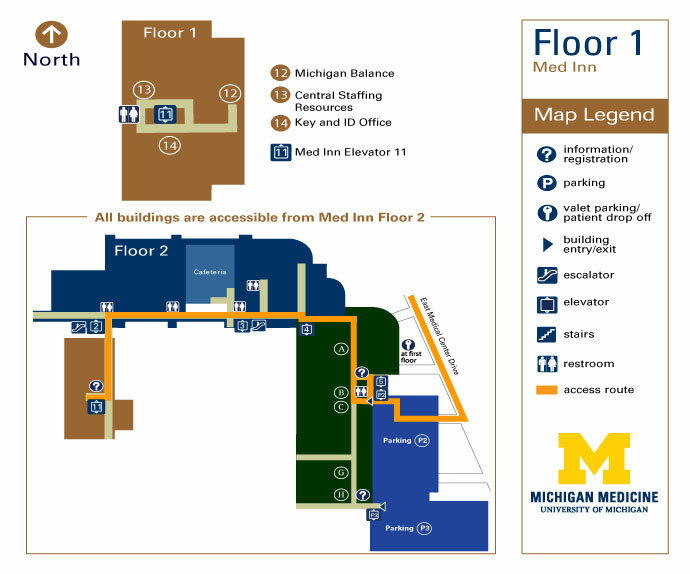 *Detailed directions to services located on Floor 1 of the Med Inn Building are listed below. Look for signage to assist you in finding your location. Turn right as you exit the elevator on Floor 1 and turn right in the 1st hallway. Turn left at the next intersection. You will pass the Key and ID Office on the right. Turn left past the elevators on your left and follow this hallway to the end. Michigan Balance is located in Room C166A. Turn left as you exit the elevator on Floor 1 and right in the 1st hallway. Go through the door. Central Staffing Resources is located in Room C108 on your right. Turn right as you exit the elevator on Floor 1 and right in the 1st hallway. Turn left at the next intersection. The Key and ID Office is on the right in Room C158.